Susan Ashbrook was born in the Midwest but longed at an early age to be like her grandmother Pearl. Pearl rode horses and built many successful businesses, and she was an independent woman when it wasn’t a popular pursuit. Susan used her creativity and business acumen to found Film Fashion a premier agency matching A list celebrities with exclusive fashion designers such as Chopard, Escada, Ralph Lauren, Lanvin, Harry Winston and Swarovski. Film Fashion was acquired by Powerhouse Ad Agency Interpublic Group. 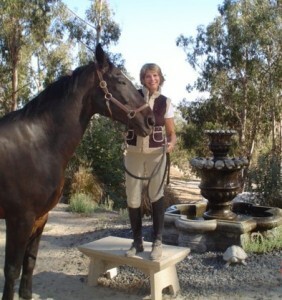 Susan’s passion for horses launched another career producing equine content. The equestrian world has stories to tell about riders, events, products, special horses and all things equestrian. We are super excited about our Equine VIP Shampoo & Conditioner for horses. With 4 horses as our test “models” our Shampoo and Conditioner is so gentle you can use it yourself! Essential oils, fruit extracts and herbs leave your horse’s coat fresh and clean, and is paraben and silicone free. Make your horse feel like a VIP! The best way to reach us is at equinevip@gmail.com We’d love to hear from you! Watch for contests and discounts on our products too!